Jerome (/dʒəˈroʊm/; Latin: Eusebius Sophronius Hieronymus; Greek: Εὐσέβιος Σωφρόνιος Ἱερώνυμος; c.  347 – 30 September 420) was a priest, confessor, theologian and historian. He was the son of Eusebius, born at Stridon, a village near Emona on the border of Dalmatia and Pannonia, then part of northeastern Italy. He is best known for his translation of most of the Bible into Latin (the translation that became known as the Vulgate), and his commentaries on the Gospels. His list of writings is extensive. 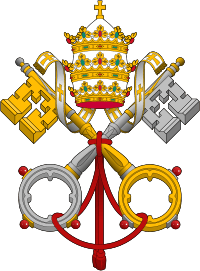 He is recognised as a Saint and Doctor of the Church by the Roman Catholic Church, the Eastern Orthodox Church, the Lutheran Church, and the Anglican Communion. His feast day is 30 September. Eusebius Sophronius Hieronymus was born at Stridon around 347 A.D. He was of Illyrian ancestry and his native tongue was the Illyrian dialect. He was not baptized until about 360–366 A.D., when he had gone to Rome with his friend Bonosus (who may or may not have been the same Bonosus whom Jerome identifies as his friend who went to live as a hermit on an island in the Adriatic) to pursue rhetorical and philosophical studies. He studied under the grammarian Aelius Donatus. There Jerome learned Latin and at least some Greek, though probably not the familiarity with Greek literature he would later claim to have acquired as a schoolboy. Jerome used a quote from Virgil—"On all sides round horror spread wide; the very silence breathed a terror on my soul"—to describe the horror of hell. Jerome initially used classical authors to describe Christian concepts such as hell that indicated both his classical education and his deep shame of their associated practices, such as pederasty which was found in Rome. Although initially skeptical of Christianity, he was eventually converted. 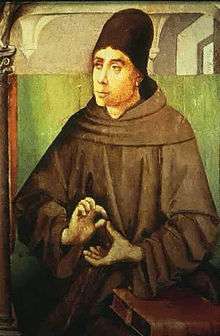 After several years in Rome, he travelled with Bonosus to Gaul and settled in Trier where he seems to have first taken up theological studies, and where he copied, for his friend Tyrannius Rufinus, Hilary of Poitiers' commentary on the Psalms and the treatise De synodis. Next came a stay of at least several months, or possibly years, with Rufinus at Aquileia, where he made many Christian friends. Seized with a desire for a life of ascetic penance, he went for a time to the desert of Chalcis, to the southeast of Antioch, known as the "Syrian Thebaid", from the number of hermits inhabiting it. During this period, he seems to have found time for studying and writing. He made his first attempt to learn Hebrew under the guidance of a converted Jew; and he seems to have been in correspondence with Jewish Christians in Antioch. Around this time he had copied for him a Hebrew Gospel, of which fragments are preserved in his notes, and is known today as the Gospel of the Hebrews, and which the Nazarenes considered to be the true Gospel of Matthew. Jerome translated parts of this Hebrew Gospel into Greek. In Rome he was surrounded by a circle of well-born and well-educated women, including some from the noblest patrician families, such as the widows Lea, Marcella and Paula, with their daughters Blaesilla and Eustochium. The resulting inclination of these women towards the monastic life, away from the indulgent lasciviousness in Rome, and his unsparing criticism of the secular clergy of Rome, brought a growing hostility against him among the Roman clergy and their supporters. Soon after the death of his patron Damasus (10 December 384), Jerome was forced by them to leave his position at Rome after an inquiry was brought up by the Roman clergy into allegations that he had an improper relationship with the widow Paula. Still, his writings were highly regarded by women who were attempting to maintain a vow of becoming a consecrated virgin. His letters were widely read and distributed throughout the Christian empire and it is clear through his writing that he knew these virgin women were not his only audience. In August 385, he left Rome for good and returned to Antioch, accompanied by his brother Paulinian and several friends, and followed a little later by Paula and Eustochium, who had resolved to end their days in the Holy Land. In the winter of 385, Jerome acted as their spiritual adviser. The pilgrims, joined by Bishop Paulinus of Antioch, visited Jerusalem, Bethlehem, and the holy places of Galilee, and then went to Egypt, the home of the great heroes of the ascetic life. At the Catechetical School of Alexandria, Jerome listened to the catechist Didymus the Blind expounding the prophet Hosea and telling his reminiscences of Anthony the Great, who had died 30 years before; he spent some time in Nitria, admiring the disciplined community life of the numerous inhabitants of that "city of the Lord", but detecting even there "concealed serpents", i.e., the influence of Origen of Alexandria. Late in the summer of 388 he was back in Palestine, and spent the remainder of his life working in a cave near Bethlehem, the very cave Jesus was born, surrounded by a few friends, both men and women (including Paula and Eustochium), to whom he acted as priestly guide and teacher. 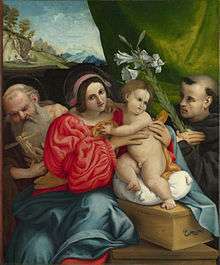 It is recorded that Jerome died near Bethlehem on 30 September 420. The date of his death is given by the Chronicon of Prosper of Aquitaine. His remains, originally buried at Bethlehem, are said to have been later transferred to the basilica of Santa Maria Maggiore in Rome, though other places in the West claim some relics—the cathedral at Nepi boasting possession of his head, which, according to another tradition, is in the Escorial. Jerome was a scholar at a time when that statement implied a fluency in Greek. He knew some Hebrew when he started his translation project, but moved to Jerusalem to strengthen his grip on Jewish scripture commentary. A wealthy Roman aristocrat, Paula, funded his stay in a monastery in Bethlehem and he completed his translation there. He began in 382 by correcting the existing Latin language version of the New Testament, commonly referred to as the Vetus Latina. By 390 he turned to translating the Hebrew Bible from the original Hebrew, having previously translated portions from the Septuagint which came from Alexandria. He believed that the mainstream Rabbinical Judaism had rejected the Septuagint as valid Jewish scriptural texts because of what were ascertained as mistranslations along with its Hellenistic heretical elements. He completed this work by 405. Prior to Jerome's Vulgate, all Latin translations of the Old Testament were based on the Septuagint not the Hebrew. 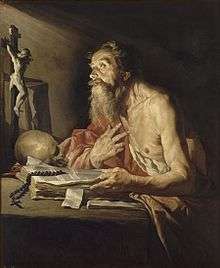 Jerome's decision to use a Hebrew text instead of the previous translated Septuagint went against the advice of most other Christians, including Augustine, who thought the Septuagint inspired. Modern scholarship, however, has cast doubts on the actual quality of Jerome's Hebrew knowledge. 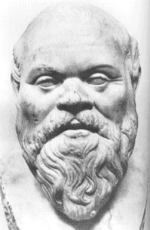 Many modern scholars believe that the Greek Hexapla is the main source for Jerome's "iuxta Hebraeos" translation of the Old Testament. This preface to the Scriptures may serve as a “helmeted” introduction to all the books which we turn from Hebrew into Latin, so that we may be assured that what is not found in our list must be placed amongst the Apocryphal writings. Wisdom, therefore, which generally bears the name of Solomon, and the book of Jesus, the Son of Sirach, and Judith, and Tobias, and the Shepherd are not in the canon. The first book of Maccabees I have found to be Hebrew, the second is Greek, as can be proved from the very style. 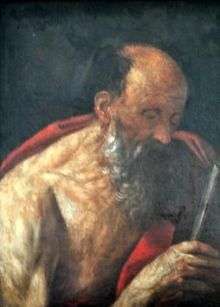 Although Jerome was once suspicious of the apocrypha, it is said that he later viewed them as Scripture. For example, in Jerome's letter to Eustochium he quotes Sirach 13:2., elsewhere Jerome also refers to Baruch, the Story of Susannah and Wisdom as scripture. In Rome (ca. 383) he wrote a passionate counterblast against the teaching of Helvidius, in defense of the doctrine of the perpetual virginity of Mary and of the superiority of the single over the married state. An opponent of a somewhat similar nature was Jovinianus, with whom he came into conflict in 392 (Adversus Jovinianum, Against Jovinianus) and the defense of this work addressed to his friend Pammachius, numbered 48 in the letters). Once more he defended the ordinary Catholic practices of piety and his own ascetic ethics in 406 against the Gallic presbyter Vigilantius, who opposed the cultus of martyrs and relics, the vow of poverty, and clerical celibacy. Meanwhile, the controversy with John II of Jerusalem and Rufinus concerning the orthodoxy of Origen occurred. To this period belong some of his most passionate and most comprehensive polemical works: the Contra Joannem Hierosolymitanum (398 or 399); the two closely connected Apologiae contra Rufinum (402); and the "last word" written a few months later, the Liber tertius seuten ultima responsio adversus scripta Rufini. The last of his polemical works is the skilfully composed Dialogus contra Pelagianos (415). Jerome is the second most voluminous writer (after Augustine of Hippo) in ancient Latin Christianity. In the Roman Catholic Church, he is recognized as the patron saint of translators, librarians and encyclopedists. He showed more zeal and interest in the ascetic ideal than in abstract speculation. It was this strict asceticism that made Martin Luther judge him so severely. In fact, Protestant readers are not generally inclined to accept his writings as authoritative. The tendency to recognize a superior comes out in his correspondence with Augustine (cf. Jerome's letters numbered 56, 67, 102–105, 110–112, 115–116; and 28, 39, 40, 67–68, 71–75, 81–82 in Augustine's). 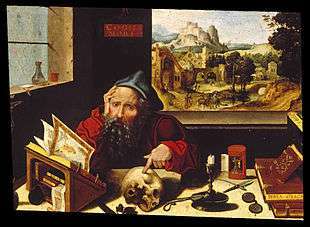 This painting by the Workshop of Pieter Coecke van Aelst depicts St. Jerome in his study. The Walters Art Museum. He is also often depicted with a lion, in reference to the popular hagiographical belief that Jerome had tamed a lion in the wilderness by healing its paw. The source for the story may actually have been the second century Roman tale of Androcles, or confusion with the exploits of Saint Gerasimus (Jerome in Latin is "Geronimus"). Hagiographies of Jerome talk of his having spent many years in the Syrian desert, and artists often depict him in a "wilderness", which for West European painters can take the form of a wood or forest. Geronimo, a religious and military leader of the Chiricahua Apache, who tenaciously fought against Mexico and the United States' expansion into Apache tribal lands for several decades during the Apache Wars, was initially known by his Apache name: "Goyahkla" (One Who Yawns). "Later he was called Geronimo (Spanish for Jerome), most likely because of the way he fought in battle against Mexican soldiers who frantically called upon St. Jerome for help. He willingly accepted the name." Jerome was the first honoree inducted into the Translator Interpreter Hall of Fame (TIHOF). ↑ Scheck, Thomas P. Commentary on Matthew (The Fathers of the Church, Volume 117). p. 5. "" ↑ Maisie Ward, Saint Jerome, Sheed & Ward, London 1950, p. 7 "It may be taken as certain that Jerome was an Italian, coming from that wedge of Italy which seems on the old maps to be driven between Dalmatia and Pannonia." ↑ Tom Streeter, The Church and Western Culture: An Introduction to Church History, AuthorHouse 2006, p. 102 "Jerome was born around 340 AD at Stridon, a town in northeast Italy at the head of the Adriatic Ocean." ↑ Schaff, Philip, ed. (1893). A Select Library of Nicene and Post-Nicene Fathers of the Christian Church. 2nd series. VI. Henry Wace. New York: The Christian Literature Company. Retrieved 2010-06-07. ↑ In the Eastern Orthodox Church he is known as St Jerome of Stridonium or Blessed Jerome. Though "Blessed" in this context does not have the sense of being less than a saint, as in the West. ↑ Pevarello, Daniele (2013). The Sentences of Sextus and the origins of Christian ascetiscism. Tübingen: Mohr Siebeck. p. 1. ISBN 9783161525797. ↑ Wilkes 1995, p. 266: "Alongside Latin the native Illyrian survived in the country areas, and St Jerome claimed to speak his 'sermo gentilis' (Commentary on Isaiah 7.19)." ↑ Patrologia Latina 25, 373: Crebroque cryptas ingredi, quae in terrarum profunda defossae, ex utraque parte ingredientium per parietes habent corpora sepultorum, et ita obscura sunt omnia, ut propemodum illud propheticum compleatur: Descendant ad infernum viventes (Ps. LIV,16): et raro desuper lumen admissum, horrorem temperet tenebrarum, ut non tam fenestram, quam foramen demissi luminis putes: rursumque pedetentim acceditur, et caeca nocte circumdatis illud Virgilianum proponitur (Aeneid. lib. II): "Horror ubique animos, simul ipsa silentia terrent." 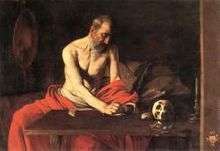 ↑ "Saint Jerome in His Study". The Walters Art Museum. ↑ Bennett, Rod (2015). The Apostasy That Wasn't: The Extraordinary Story of the Unbreakable Early Church. Catholic Answers Press. ISBN 1941663494. ↑ Pierre Nautin, article Hieronymus, in: Theologische Realenzyklopädie, Vol. 15, Walter de Gruyter, Berlin – New York 1986, p. 304-315, here p. 309-310. ↑ "Jerome's Preface to Samuel and Kings". ↑ Barber, Michael (2006-03-06). "Loose Canons: The Development of the Old Testament (Part 2)". Retrieved 2007-08-01. ↑ Jerome, To Paulinus, Epistle 58 (A.D. 395), in NPNF2, VI:119.: "Do not, my dearest brother, estimate my worth by the number of my years. Gray hairs are not wisdom; it is wisdom which is as good as gray hairs At least that is what Solomon says: "wisdom is the gray hair unto men.’ [Wisdom 4:9]" Moses too in choosing the seventy elders is told to take those whom he knows to be elders indeed, and to select them not for their years but for their discretion [Num. 11:16]? And, as a boy, Daniel judges old men and in the flower of youth condemns the incontinence of age [Daniel 13:55–59 aka Story of Susannah 55–59]"
↑ Jerome, To Oceanus, Epistle 77:4 (A.D. 399), in NPNF2, VI:159.:"I would cite the words of the psalmist: 'the sacrifices of God are a broken spirit,’ [Ps 51:17] and those of Ezekiel 'I prefer the repentance of a sinner rather than his death,’ [Ez 18:23] and those of Baruch, 'Arise, arise, O Jerusalem,’ [Baruch 5:5] and many other proclamations made by the trumpets of the Prophets." ↑ Jerome, Letter 51, 6, 7, NPNF2, VI:87-8: "For in the book of Wisdom, which is inscribed with his name, Solomon says: "God created man to be immortal, and made him to be an image of his own eternity. 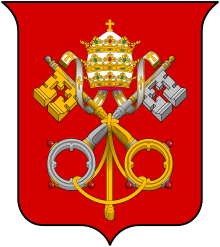 "[Wisdom 2:23]...Instead of the three proofs from Holy Scripture which you said would satisfy you if I could produce them, behold I have given you seven"
↑ "regulae sancti pachomii 84 rule 104. ↑ W. H. Fremantle, "Prolegomena to Jerome", V.
↑ "St. Jerome: Patron Saint of Librarians | Luther College Library and Information Services". Lis.luther.edu. Retrieved 2014-06-02. ↑ "Jerome, St." Pages 872-873 in The Oxford Dictionary of the Christian Church. Third Edition Revised. Edited by E. A. Livingstone; F. L. Cross. Oxford: Oxford University Press, 2005. 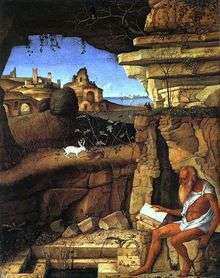 ↑ "Eugene Rice has suggested that in all probability the story of Gerasimus's lion became attached to the figure of Jerome some time during the seventh century, after the military invasions of the Arabs had forced many Greek monks who were living in the deserts of the Middle East to seek refuge in Rome. 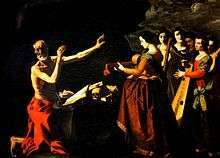 Rice conjectures (Saint Jerome in the Renaissance, pp. 44–45) that because of the similarity between the names Gerasimus and Geronimus – the late Latin form of Jerome's name – 'a Latin-speaking cleric . . . made St Geronimus the hero of a story he had heard about St Gerasimus; and that the author of Plerosque nimirum, attracted by a story at once so picturesque, so apparently appropriate, and so resonant in suggestion and meaning, and under the impression that its source was pilgrims who had been told it in Bethlehem, included it in his life of a favourite saint otherwise bereft of miracles.'" Salter, David. 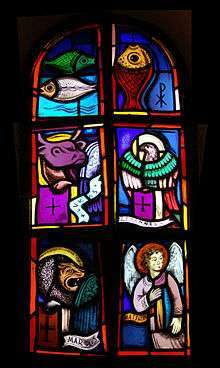 Holy and Noble Beasts: Encounters With Animals in Medieval Literature. D. S. Brewer. p. 12. ISBN 9780859916240. ↑ "a figment" found in the thirteenth-century Golden Legend by Jacobus de Voragine Williams, Megan Hale. 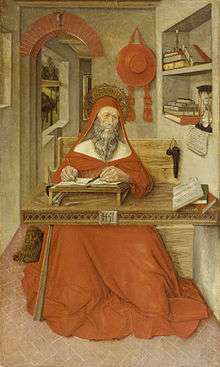 The Monk and the Book: Jerome and the Making of Christian Scholarship. Chicago: U of Chicago P. p. 1. ISBN 978-0-226-89900-8. 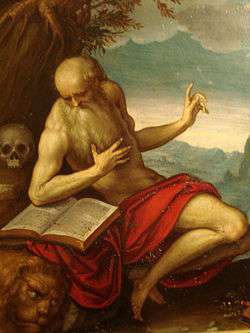 ↑ "Saint Jerome in Catholic Saint info". Catholic-saints.info. Retrieved 2014-06-02. 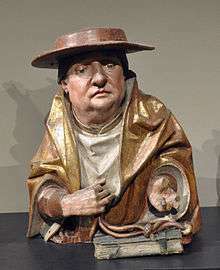 1 2 The Collection: St. Jerome, gallery of the religious art collection of New Mexico State University, with explanations. Accessed August 10, 2007. ↑ "GERONIMO (ca. 1829–1909)". Oklahoma Historical Society. Retrieved 2015-01-08. ↑ "Patron Saint of Translators". ititranslates.com. January 17, 1999. 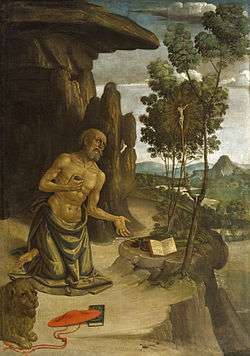 Wikimedia Commons has media related to Saint Jerome.